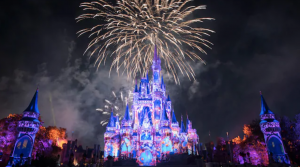 Staying on property at a Walt Disney World Resort truly adds a whole new layer of magic to your Disney vacation! 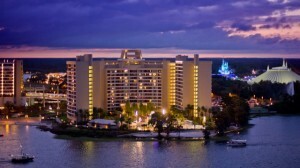 The Disney Resorts provide you with luxury, world class hospitality and of course magical perks! 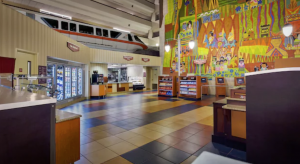 Staying at a Disney World resort hotel you receive many benefits exclusive to guests staying on Disney property, such as the 60-day out FastPass booking window, extra magic hours to enjoy the park and complimentary Disney Transportation! Every Disney Resort is different and offers something unique in the ways of theming, atmosphere and perks! Today I am going to share with you my experience staying at Disney’s Bay Lake Tower located at Disney’s Contemporary Resort! I fell in love with this resort and can’t wait to stay their again in the future. 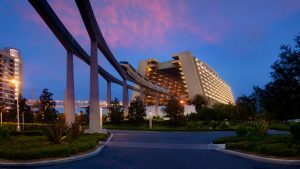 Here are my top 5 reasons to love Disney’s Contemporary Resort! Of all the Disney Resorts the Contemporary is the resort with closest proximity to the Magic Kingdom! This is actually the only Disney resort that you can walk to Magic Kingdom from! From the balconies of the resort that are facing towards Seven Seas Lagoon you will have incredible views right into the Magic Kingdom park! You will feel like you can reach out and touch it! This also means you have a front row seat for the fireworks! I have watched the fireworks from Disney’s Contemporary many times and it is such a unique viewing location! You get a birds-eye view of the park and the fireworks appear at eye-level! It is truly breathtaking! From the balconies on the opposite side of the resort, facing Bay Lake you will enjoy magnificent views of the naturally formed Bay Lake along with sights of Epcot, Hollywood Studios and Animal Kingdom all in the distance. You can catch the fireworks from Epcot and Hollywood Studios on this side of the hotel! Disney’s Contemporary Resort is located on the monorail loop in the Magic Kingdom resort area. 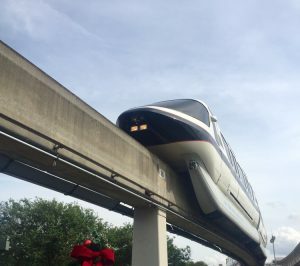 You can take the Disney Resort Monorail directly from your resort to the Magic Kingdom park! The Disney Monorail actually drives right through the center of the hotel then pops back outside. It is an incredible engineering marvel! This fun mode of transportation will get you to the park in a breeze! Also from the Contemporary you can take the monorail one stop over to the Transportation and Ticket Center, then transfer monorails to go directly to Epcot! Disney’s Contemporary Resort is full of wonderful dining options! 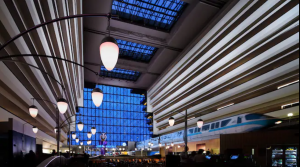 They have everything from casual table-service dining at The Wave, to quick-service dining at Contempo Café, to fine dining at the California Grill. I love all these locations but my favorite will forever be the California Grill! This is the spot to go when you are looking for a very special and memorable meal! 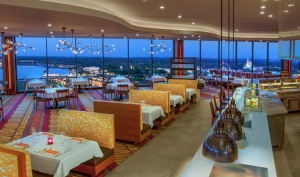 This signature dining location can be found on the top level of the resort, on the 15th floor. The restaurant is encased with floor to ceiling glass windows that showcase the breathtaking views. The 4 observation decks that bookend every corner of the restaurant are great spots to watch the fireworks! I will be honest I always thought the Contemporary looked cool but of the 3 resorts located on the Magic Kingdom Monorail loop, (Contemporary, Polynesian & Grand Floridian) I always thought I would like the theming of the Polynesian and Grand Floridian more than the Contemporary. Then I stayed here and everything changed! I fell in love with the unique theming the Contemporary provides. Staying here made me stop and more closely appreciate all the details of the beautiful resort. It is sleek and modern, yet retro at the same time. It is futuristic while still grounded in its heritage. Most importantly all throughout the resort and the rooms, there is pixie dust and little Disney touches that can be found in the most unexpected places! Watch our NEW YouTube video for a room tour of a studio room at Bay Lake Tower at Disney’s Contemporary Resort! Disney’s Contemporary is now one of my all-time favorite Disney World properties! I am dreaming of the next time I get to stay at this amazing resort! I highly recommend giving this Disney Resort a try on your next Disney vacation, then you will see exactly what I mean about this hotel having something truly special and unique! Plan your next adventure today to Disney World or anywhere in the world by contacting your Kingdom Magic Vacations Travel Planner! This entry was posted in Dining, Disney Dining, Disney Parks, Disney Resorts, Disney Restaurants, Disney Vacation, Magic Kingdom, Walt Disney World, Walt Disney World Resort - Orlando and tagged Contemporary Resort, disney, disney world, disney world resorts, Disney’s Contemporary Resort, Walt Disney World on February 1, 2019 by Megan Przychodzien.